Beautiful and very rare currently produced hand crafted Luger Artillery holster rig used by German Army troops. Patterned after the 1914 Hardshell holster rig this set features the heavy duty Black holster complete with attached cleaning rod holder,takedown tool compartment,Double magazine pouch, inside lifting strap and adjustable leather carry strap. 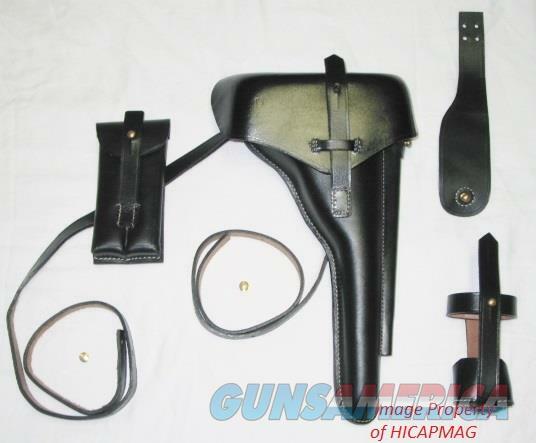 This set also contains a 2.5" belt loop and shoulder stock strap to attach the holster to the board stock. Takedown tool and Cleaning rod are available separately. Buyer pays flate rate $12.95 Priority Mail shipping w/tracking number. Check out my other items for sale as I combine shipping.